I'm a dad, with a beard. It doesn’t seem to matter how many times she pulls all the movies off of the DVD rack, or how many times she throws all of her toys out of her toy basket, Paige never gets tired of this act. She is starting to learn how to put things back where she found them, but getting her to put ALL of them back is not proving to be as easy as it sounds. 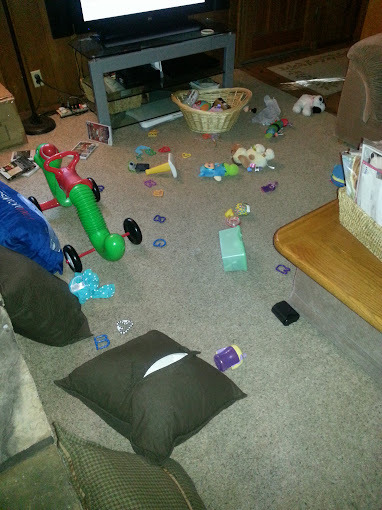 I’d venture to guess that my wife has the luxury of picking up all the DVD’s and all of her toys multiple times throughout the day. Anyway, as I was saying.. There was once a time, when my wife and I were just talking about having a baby, long before Paige was born, when we both thought it would be a good idea for me to be a stay at home Dad. I will say this, with quite a bit of certainty, as much as I LOVE spending time with Paige, and I love to play with her when I get home from work, I cannot imagine how difficult it is to be a stay at home parent. Kids are crazy and rambunctious, but we love our own more than we can ever express. As difficult as it can be to keep up with a kid who’s almost 1, I will say, I cherish every moment I get to spend with her and my wife, even if a lot of that time is spent picking up toys, or games or DVD’s, or making sure she’s staying out of trouble, and not putting her fingers in light sockets.